Speaking some basic travel French will make your experience much easier, and locals will be much happier to help you. Knowing a few key French words can make a huge difference in how you will interact with locals in France. Here is a list of 12 of the top used French phrases by travellers. This is an important one and will greatly influence how the next few minutes of your interaction plays out. Whether you are looking for directions or asking about a menu item, opening with a simple ‘hello’ can go a long way. These two words are so simple, but can really help you out when in a bind. Yes and no in French can be very useful when trying to attempt basic communication with a French person. Once they realize that your vocabulary is limiting your ability to form your own sentences, they hopefully will take charge of the interaction by asking you questions. ‘Yes’ and ‘no’ can always be useful to answer these questions and hopefully reach a helpful conclusion. 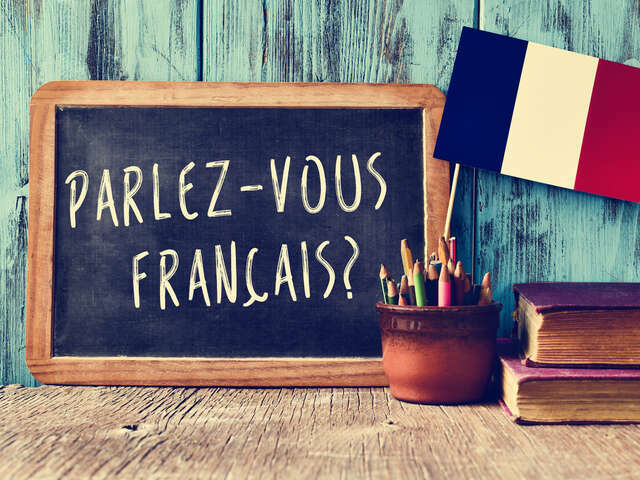 Of course it is appreciated that you try to speak French, but if you are really in a bind and need to speak to an English speaker, showing respect and manners will go a lot further to help your cause. Many French people do speak basic English. Tourists who report that nobody in France speaks English may likely not be as savvy a traveller as you. These tourist are the ones who often ran up to the first person they saw and started babbling in English without even a ‘bonjour’. This is seen as very rude in French and rarely gets the desired response. A city map is a lifesaver when wandering streets you are unfamiliar with. This should be one of the first things you get your hands on when visiting a new city, if you haven’t brought one with you. You’ll find local maps at most tourist offices, but you can also buy them in shops. This question will also help if you’re looking for a map posted within the city. You’ll find them fairly regularly in Paris. If you ask a local, they might be able to direct you to the nearest one. As these maps are usually only of the nearby area, they can be particularly helpful if you’re looking for directions to somewhere that you know is nearby but can’t seem to locate. You’ll be able to take a look at the smaller streets that might not appear on larger maps of the whole city. Getting around an unfamiliar city can be tricky and sometimes having a map is not enough to get you from point A to point B. It’s always good to be able to ask people how to get to important destinations. The best thing to do in most French cities, particularly in Paris, is to find the closest bus, train or metro stop. Bonus is that most transit stops in Paris have a map posted outside of them. This will help you see where exactly you are in relation to where you need to go. Just about any tourist spot you want to visit in Paris will require you to first purchase a ticket. If you’re looking for the ticket window, ask for the guichet. You’ll soon be ready to visit the museum, gallery, landmark or other site. This phrase will also be helpful if you’re buying any other sort of ticket, from a movie ticket to a train ticket to a metro ticket. Anywhere you need to purchase an entry or access pass of any kind will have a guichet. This is another great sentence that serves many scenarios. It can work nearly everywhere: in a store when you’d like to buy an item, on the bus or at the museum ticket window. Something interesting to note: Asking the price of a menu item is usually seen as rude, as prices are posted on the menu. There is some cultural context to restaurant price visibility. Prices will be posted when you’re meant to see them, and they will not be posted when you’re not meant to see them. For example, in fancy gourmet restaurants, menus with prices are not given to the ladies at the table. French service is not the same as North American service. The overly friendly waiters you’ll find in North American restaurants are nowhere to be found in France, but salespeople might seem a bit aggressive or over-eager to North Americans visiting France. Knowing this phrase can give you some space to look around a shop at your leisure. If you run into trouble in France, one good address to have on hand is that of the Canadian embassy. A stolen passport can be replaced at the embassy, and you might need their help if there is ever a political problem in France and you need to exit the country quickly. That’s a rarity to be sure, but it’s better to be prepared while travelling! In the unfortunate situation you fall ill while away or are injured, this phrase is one you will be grateful you have in your vocabulary. If you need to see a doctor, you might be asked about your insurance coverage. If you have a traveller’s insurance — which we hope you do — this is how you can let someone know. Speaking some basic travel French will make your experience much easier, and locals will be much happier to help you. Here are some more key phrases and words that will help you out, along with sound bites so you can listen to the pronunciation first hand.